Show RADIOACTIVISTS in your city! 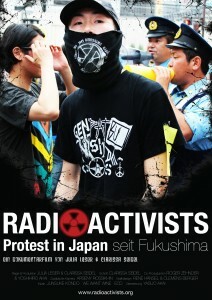 RADIOACTIVISTS wants to show the developments of the Japanese No-Nukes-Movement and wants to help and support the Japanese activists. Please help us with organizing a screening of the movie in your own city! Just order a DVD of our documentary, get a cinema to screen it or find a location for a screening and inform the press and the public. The screening can be combined with a panel or info-event to get even more attention. ‘Radioactivists’ is under CC-license which means it can be screened for free if it is shown at a non-commercial event. If you tell us the date of the screening we will publicize it on our homepage. Just send us an e-mail to gingerandblonde.productions@gmail.com and we will provide further information. Thank you!